The University of Florida is a research university located in Gainesville, FL. At the heart of its 2,000-acre campus is Emerson Alumni Hall, a red brick and limestone building that hides a multi-purpose facility dedicated to alumni, faculty, and staff. It is used for fundraising activities, as well as lectures, conferences, receptions, and many types of meetings and special events. 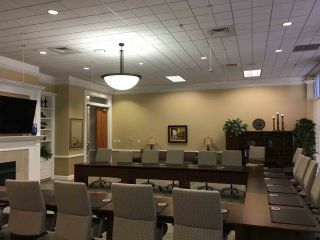 A key space within the facility is the Center for Preeminence, a high-end conference room that hosts equally high-end meetings. With only a small display and conference phone system, the room’s AV was not reflective of the importance of the meetings it hosts. Lon Vance, senior engineer and project manager for audio visual systems at the university, was called in to lead the installation of updates to the AV. University administrators were looking for a high-quality microphone solution that was as discreet as possible, preserving aesthetic appeal, minimizing distractions, and allowing meeting participants to focus on the business at hand. Through online research Vance found the Audix M3 tri-element ceiling microphone with the Servoreeler precision microphone retraction system option. He spoke with a few colleagues in the industry and they all highly recommended the Audix M3 / Servoreeler combination. Another big advantage of the Audix M3, according to Vance, is the ability to selectively control each of the microphone’s three capsules (in this case, via a Crestron touch panel), allowing him to turn off unneeded capsules, such as those that might be aimed at a buffet line. The entire room upgrade was completed in a day and half, with the mic install taking a half day.